The M307 pocket-sized print server plugs directly into your printer, making it a network printer. Networking Printers Saves You Money. Now you can convert your stand-alone printer, which serviced one user, into a Network Printer which can service multiple users! 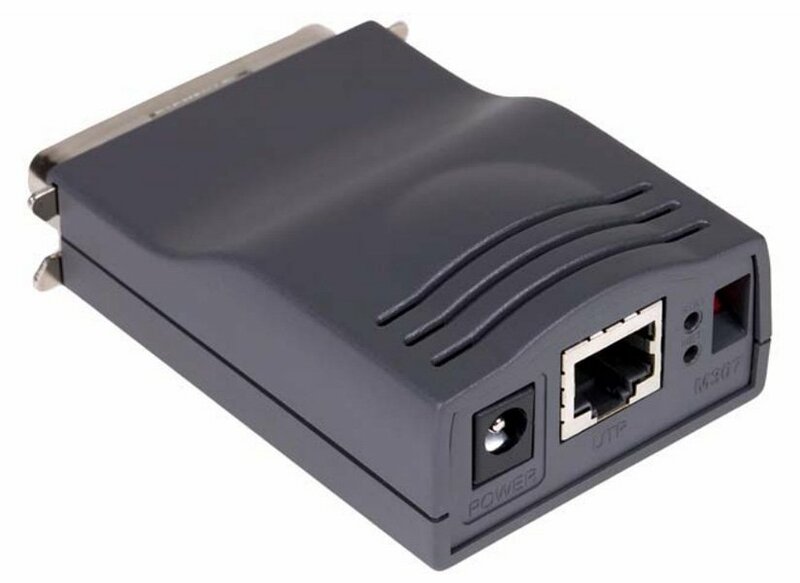 Simply attach a M307 Ethernet Print Server to your printer's parallel port. You can now locate the printer anywhere on a 10 BaseT or 100 Base-T LAN. After following some simple configuration steps, the printer can be simultaneously shared with users on a TCP/IP Network. Key Features • Simultaneous support of multiple users and multiple Operating Systems. • Fully manageable from your web browser! • Easy firmware upgrades. • Multi-level configuration security through passwords, permission levels and access lists. • Standard features such as ASCII to PostScript conversion, multiple virtual printer destinations, SMTP email status reporting, page counting, extensive header and trailer strings and more!